After my father, a contracted civil engineer in Myanmar (Burma), passed away, I honored his memory by earning my own degree in civil engineering. But my dream has always been to become a computer technician. Achieving that goal took self-discipline, focus, and bravery. In the early 2000s, 25 fellow Burmese and I began taking photos of government soldiers committing atrocities in the villages. We sent the images to outside media sources, who reported their behavior around the world, angering the military. When the government started to suppress the images and threaten me in 2002, I was forced to flee to Malaysia. I left my family behind and hoped they would be safe if they relocated and changed their names. I stayed in a Malaysia for nine years, at first unable to work. However, I was determined to develop my skills, so I took computer classes. Despite having very little formal training, I got an IT job in at the country’s largest lifestyle mall. In 2013, I had the chance to move to the United States, and I took it. I resettled in Boise under the International Rescue Community (IRC). To survive, I had to accept any job that I was offered when I arrived. I worked as a hotel housekeeper, then temporarily on the production line at Micron. Meanwhile, I decided to continue pursuing my passion for technology. I founded the Boise Burmese Computer Lab, where to this day I repair computers and teach lessons to refugees and friends free of charge from my in-home shop. I feel this is my duty; immigrants and refugees need computer skills to reach their goals in America. Ready to work full time in my field, I joined Global Talent Idaho in early 2015. For six months, they trained me on how to get a job in the U.S. They helped me build a resume, market myself and network with others, write cover letters, and interview effectively. 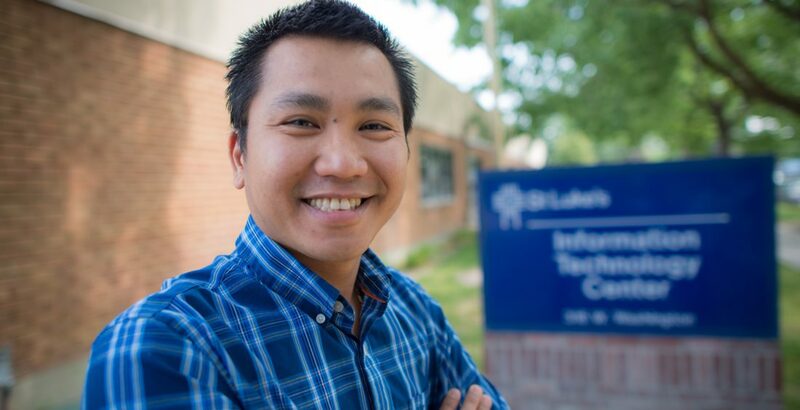 When I got an interview at St. Luke’s through the Flextechs Company, I entered the situation confidently and was offered a job working with computers and technology. My love and passion have been turned into my career. GTI lifted me up when I was down. I love them so much and I always pray for their success.